Guest editor Matt Tompkins has chosen four pieces for publication as part of the “Dis/appearances” theme. Congratulations to the selected authors: Joe Buamann, Emily McKay, Jefferson Navicky, and Phillip Sterling. Competition was stiff, but these four stood out above the crowd. We’ll be posting the accepted stories from these four authors throughout the weekend of July 15th. This date also coincides with the release of the ebook version of the guest editor’s latest book, Souvenirs and Other Stories (the print version of Souvenirs was released in mid-June). Thanks to all those who submitted to this theme! We hope that you’ll consider our next themed call for submissions, “Fragmented,” considering pieces now through July 15th, guest edited by Melissa Reddish. Conium Press is a socially responsible publisher. Among other things, that means we give back to the community. A portion of every print-run goes to charity. In the past, our managing editor has decided where the donated copies wind up. This time around, we thought we’d give the author a voice in the matter. I’ve chosen to donate copies of Souvenirs and Other Stories to Open Books in Chicago, because their multifold mission includes two things very close to my heart: browseable, brick-and-mortar bookstores; and literacy education. Having spent a year as an AmeriCorps literacy tutor, I’ve seen firsthand evidence of the acute need for additional reading and writing instruction for many of our country’s primary school students. I’ve also gained an appreciation for the positive difference that volunteer programs can make in this arena. And having spent countless hours since childhood, browsing bookstores and burying my nose, reveling in the joy of reading, I have a deep fondness for any place that individuals and families can go and unabashedly indulge their love of the written word. The fact that Open Books combines the two makes it a no-brainer. I would love to see their model catch on and go nation-wide, and I’m pleased to support them with donated copies of Souvenirs and Other Stories. Matt Tompkins talks about his new Conium Press title, Souvenirs and Other Stories, for Monkeybicycle‘s “If My Book” column. For this Monkeybicycle feature, authors compare their recently released books to weird things. It’s a fun column and a unique way to get a taste of a new book directly from the author. 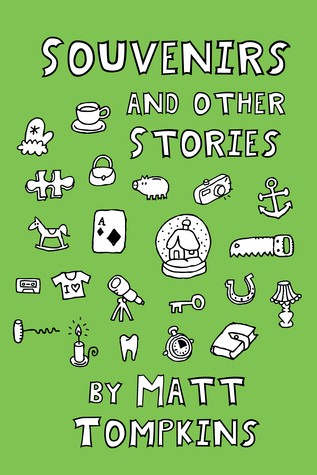 In one section, Matt says “If Souvenirs and Other Stories were a cat, it would be a huge, flame-orange, polydactyl housecat.” Elsewhere, he remarks “If Souvenirs and Other Stories were an urgent question, it would be, ‘Great, but how will you pay the bills? '” Read the entire post here. Souvenirs and Other Stories hits shelves today! We’re kicking things off with a Goodreads giveaway. Between now and June 30th, you can request one of ten free copies on Goodreads. Winners will be chosen at random after the giveaway period closes. 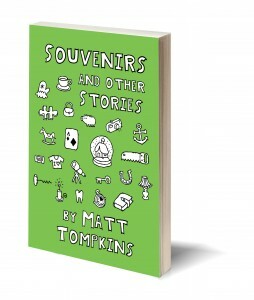 It’s Launch Day for “Souvenirs and Other Stories,” by Matt Tompkins! Buy it directly from Conium Press. Buy it from Barnes & Noble. This is also the last day to submit to our “Dis/appearances” theme, guest edited by Matt Tompkins in celebration of his new book. Enter our Twitter giveaway here. Lastly, if you’re a literary reviewer interested in Souvenirs, please contact us to request a copy. If you’re a bookseller or librarian, you can order through our distributor, Ingram Book Group. We’re excited to see this book officially hit shelves. Get your copy today, and remember to leave a Goodreads and/or Amazon review, chat about Souvenirs on social media, and tell your friends about it. Thanks for supporting small press publishing and independent literature! Souvenirs and Other Stories releases on June 15th. Through the book’s launch period, we’ll be giving away free prizes on Twitter! New prizes will be offered each week (spoiler alert: most prizes will be books). 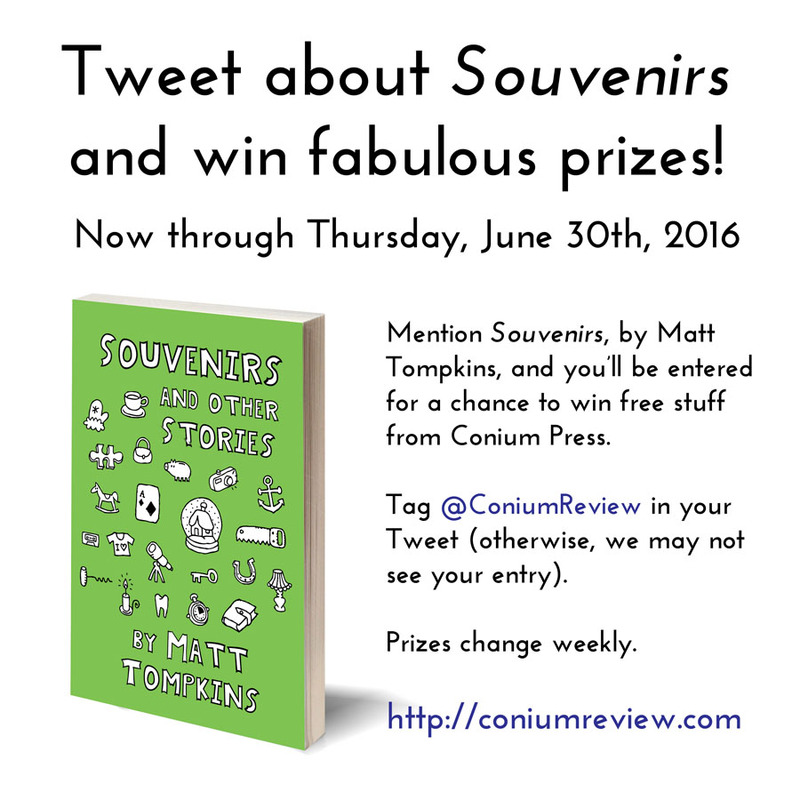 To enter, simply Tweet something about Souvenirs and tag @ConiumReview in your Tweet. This should be a real Tweet that helps spread the word about Souvenirs. You could share a links to our website, Goodreads, Amazon, or whatever. Maybe share a picture. Come up with a jingle. It’s your choice, but make sure your post showcases at least five seconds of actual effort. Most of the time, one Tweet will count as one entry. However, if we really like your Tweet, we may arbitrarily award you a bonus entry! You may also increase your odds of winning by Tweeting more than once, but please space out your Tweets over several days. Do not spam. Seriously. Nobody likes spam. And if we find out that you’ve created fake accounts to boost your odds of winning, you’ll be disqualified. Our prizes are just books, so relax. It’s not like you’ll be winning a million bucks. No need to cheat here. We’ll make a numbered list of each entry and then roll a d20 or use a random number generator or something. If you’re a winner, we’ll contact you on Twitter and ask for your mailing address. We’ll only mail printed books to winners in the United States. If you live internationally, we can offer free digital copies instead.